Goal setting is the buzz every new year, but without the right level of confidence, we can get stuck. The same goes with your financial goals, which is why we are tackling financial confidence and how to improve it. 7 ways to improve it. Recently I read the following: “Insecurities will destroy you, while real confidence will take you to a level very few attain”. We don’t have time to be insecure or lack confidence. Now that doesn’t mean that if you are feeling insecure or lack confidence that you are doomed. It means that we need to work on changing this. Financial Confidence = Your own belief in how you manage your personal finances. It includes earning money, saving money, and spending money. ✔️ If you don’t have financial confidence it will be easier to find ways to lose with your money than to win with it. ✔️ When you have this financial confidence on your side, it will get you through the tough times life throws at us. #1: Own and claim that you can be financially confident. Well, I’m not big on faking it for others, but when it comes to your mind I am all for it. Say “I am financially confident” over and over again until you believe it and it gets easier to say. Tony Robbins says resourcefulness is the ultimate resource. I know you are resourceful you know why? It is innate in you with the sheer fact that you are a woman. We are problem solvers by default. How many times have you been in a situation where you were lacking something and you made things happen anyway. Like the time you realized you had to be in three different places at once in being that taxi mom and you found a way to get your kids to those 3 places. It doesn’t have to be perfect, you just have to do it. You don’t have to talk about the latest stock market trends or the best funds to invest in. Talk about new apps you have loved, saving tips you have learned, wins you have had. This means even taking action even when you are scared. You don’t have to pay off $20,000 by next month (unless that is financially possible for you). Find an action that you haven’t been taking that is far overdue, like putting your savings on auto-pilot for example. The sheer act of celebrating will no doubt boost your confidence levels. #6: Surround yourself with people who have the financial confidence you want to have. Who are you currently surrounding yourself with? If you are finding yourself with people who are talking about how broke they are or how they can’t afford this, you need to run. Instead, you need to surround yourself with those who have an abundant mindset. Those who are taking action in improving their finances and those who aren’t afraid to get “messy” with their finances. Rate your confidence from 1 (not being confident at all) to 10 (being extremely confident). Why did you rate yourself this way? What can you do to improve this rating? Pick one of the seven ways to improve your financial confidence and get into action! 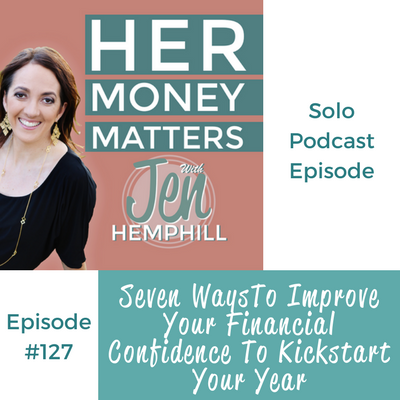 The post, Seven Ways To Improve Your Financial Confidence To Kickstart Your Year | HMM 127 appeared first on the Her Money Matters Podcast.